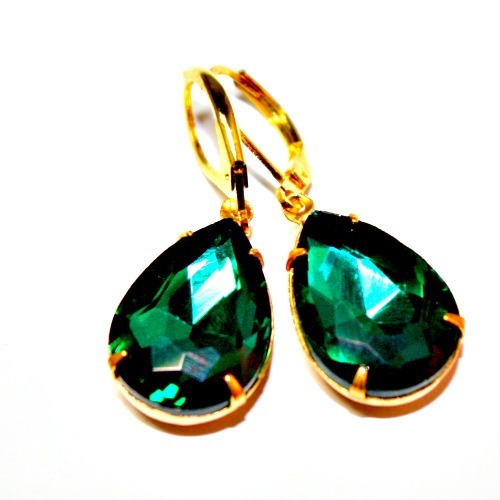 Sparkling Emerald Green jewels are stunning, pear shaped and sure to garner plenty of attention. Spectacular deep rich Emerald Green Emerald color, the jewels are vintage glass and foil backed to give them an extra sparkle. Meticulously hand created by American jewelry designer and artist HKennedy. Elegant, they are set in natural brass with lever backs. Like all brass, the settings contain no nickel or lead so they are gentle on your skin. Stones measure 3/4" l. x 1/2" w. Add to your collection or give as a luxurious gift. For those who love to capture hearts, jewelry that makes you shine!